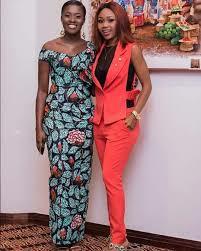 Ghanaian actress, Rosemond Brown has warned Yolo actress Fella Makafui to be careful with her new boyfriend-Medikal. Speaking in an interview which was monitored by Newshuntermag.com on Cheers FM's Entertainment Power show, hosted by Tactical Shifo in Sunyani, Rosemond said Medikal can use and dump Fella Makafui--so the latter should be careful. "Oh no, I respect and love anybody in the industry. I don't really have a friend...I treat all of them as my Sisters. I have already said that I respect Fella, Sister Derby, Moesha and the rest. But I am against what Fella is doing now by snatching Derby's boyfriend and also sharing a video in which they were kissing online. In life, if you are against someone's success, it will be difficult for you to be successful also. "Sharing the video on social media did not show maturity...I didn't expect this from Fella. Even if you have snatched him, keep whatever you will do privately. She should be careful because she is not the only woman Medikal have. If she doesn't take care he would use her money and dump her... If it happens like that I won't do any video for her ooo." Ghanaian rapper Medikal and Fella Makafui have been in the news lately after his relationship with Sister Derby came to an end. As to whether Medikal and Fella Makafui will tie the knot, only time will tell.